I arrived dressed to the hilt to help the movers with the boxes. It’s all gone downhill since then. The grey hairs slowly started overtaking the dark ones. My nails began representing tree stubs. And when I thought, it can’t get worse, I reacted to some new age Ayurvedic face wash and broke out into a patch of facial redness. As the mature, intelligent mother of two I now am, I immediately sought to get rid of it.Â First by scratching the affliction and then coating it with a tub of concealer. The doctor sealed my fate withÂ a verdict of medicated cream and no makeup for a week. No make up for a week? This was a new glamour low point. That too just as I was getting ready to present the best-ever-PR-plan and welcome some most glamorous friends for an Indian brunch in the new home. Worryingly still, oneÂ part of the afrementioned dynamic duo was suffering the ill effects of a night out with her local mumsgroup. Little did she know I was going to frighten her with a home-grownÂ rendition of the Rocky Horror Show. Mercifully, the presentation took place in a private, mini cinema complete with dim lighting. For Indian brunch I wore a polka dot apron, a cheerful smile and let the cooking do the impressing. 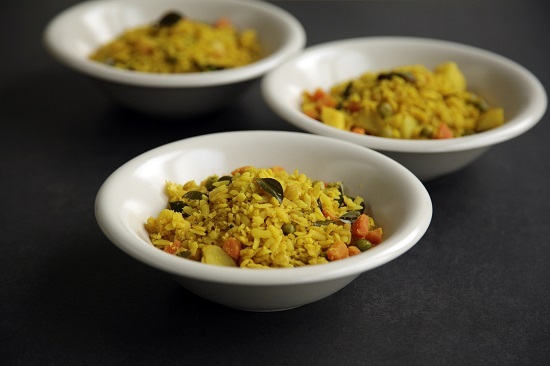 The central feature was a mixed vegetable Poha, an airy, soft, lemony pulao made with flattened rice. This has a seriously moreish quality to it, and doubles up as a light lunch or afternoon snack. The trick is to moisten the poha with cold water in a colander first to fluff the grains up, without letting it get too soggy and fall apart when cooking later. I served this with bread pakora and a plate heaped with chocolate and blueberry muffins (cooked lovingly in the fine kitchen of a local supermarket). The poha was an instant success. Hangovers cleared. Sprits soared. And four hours in a salon later, the glamour levels partly lifted too. Tip the poha flakes into a large colander, soak well with cold water and leave to rest in the kitchen sink. While it’s slowly swelling, peel and chop the carrot and onion into little pieces. Next, bring the oil to heat in a large pot on high. When it starts bubbling if you touch it with a wooden spoon, tip a pinch of asafoetida into it, then the mustard seeds and curry leaves. As they sizzle up, throw in the turmeric and chilli powder along with the chopped carrot and onion. Stir this for a minute to seal, then add half a cup of warm water and boil for 10 minutes until the carrots are soft. Mix in the peas at this point. While the vegetables are cooking, mix the sugar into the lemon juice. Finally, give the poha in the colander a good rinse in the sink and then tip into the vegetable mixture. Gently stir the whole lot together gently to coat the poha with the turmeric, add salt to taste and drizzle the lemon sugar mix on top. Serve piping hot, with a little pickle if you fancy it. Poha it is 😀 and it has been in my kitchen for the past 7 days straight. a how-to video in your new swanky kitchen is in order, non? Oh no! I’m sorry to hear about your reaction! I did the same when I tried some Ayurvedic pills while I was in India… I broke out in hives ALL over my body. I was like one large hive. So scary. Thanks for the recipe, I’m a new subscriber and love all the amazing meals. I just returned from my first trip to India a couple of weeks ago and can’t get enough of the food. Can’t wait to add this to the list of tasty things to try! I hope you are getting better now, from the reaction! I once got reacted to face bleach.. and the worse part, before my engagement day!!!! I dont even remember how the day of the engagement passed…. I was so tensed and worried that my in-laws would think that something is wrong with me 🙂 Luckily hubby dear was there to save the day! BTW the poha looks very good!! Thanks for posting this – I loved the Poha that was served for breakfast sometimes when I was staying in India on an artist residency but never knew what it was. Now I know I can make it at home! Thank you! Poha is great I love it when I go to India, mainly it is served for breakfast. Off to India again in November. Capital of BEST FOOD !! Keep up the wonderful work, just about to go and buy your book. Poha are my favourite way of satisfying my belly quickly. I usually make it with just potatoes and onions so can’t wait to try your recipe! Poha is a must and a weekly affair in my house. I would like to narrate one story here – We went to a vacation to Malvan(Maharashtra) and as Poha is a famous dish we ordered Poha for snacks, My friends loved it so much that by the end of 3 days, 8 of us actually ate 56 plates of Poha :-). Love when fresh coconut and coriander is sprinkled over it.